They say that the most dangerous farm animal is a dairy bull. And even more dangerous, is the bottle-fed dairy bull because he does not fear the hand that fed him. We happen to have a bottle-fed Guernsey dairy bull on our farm that has now grown into teenager-bullhood. There really wasn’t a thorough, thought-out plan to such insanity. It just kinda happened after we shelled out hundreds of dollars to the A.I. lady and never had any cow babies. We figured that maybe having the real thing in the pasture might be a bit cheaper than the frozen boys. One thing led to the other and we ended up with a real bull living 50 feet from our back yard and me a wreck from worry. It’s another one of those farm things where you just kinda see how it goes and if it doesn’t work out you’ll figure out something different later. My husband comforted me with the promise that I will get hamburger out of the deal. We brought Spanky home when he was just days old and bottle-fed him. It was a great experience for our children to have such a big responsibility. As he matured, we kept a close watch on him. Spanky was fine until recently when his bullness kicked in. Not too long ago, the boys let the cows out of their pasture and moved them to a more lush grazing area—which is really a fancy way of saying: our overgrown front yard needed to be mowed but our lawn mower was broken. When it was time for them to be moved back into the pasture, Spanky the bull decided he didn’t want to go back into the pasture. He stomped and snorted and threw a little bull fit letting us know that he was no longer trustworthy. He was a bull and he was starting to act like one. It was time for us to start really treating him like one. He’s been locked up in a secure pasture since that day and after he’s bred all our cows, he’s off to the butcher before he turns 3 years old. That night, my husband strictly and sternly warned the children about the bull. Near the end of the 3 1/2 minute conversation with my 5 year old about “bull parts”, I finally figured out that she was talking about his horns! His HORNS! Of course!!! She’s right! None of our girl cows have bull parts…er…I mean…horns! I left it be and finished making supper. Problem solved or at least put off for another day. I’m just glad this conversation didn’t take place in public. Farm kids (or maybe it’s just my kids???) are notorious for knowing way too much information and unloading it on unsuspecting normal folk at unpredictable times. Oh Beth we have a jersey bull right now. I am petrified. Seth keeps saying lets kill that bull and eat him and keep his horns. I have him petrified of the thing. 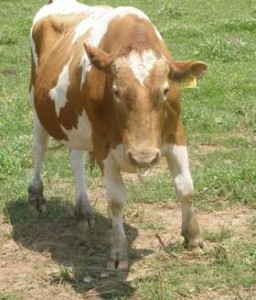 oNE THING WORTH MENTIONING UM ALL OF OUR girl cows have horns. They are not girl parts or boy parts they are bovine parts. HAHA! So true! We have had to implement the rule at the supper table that prohibits discussions of reproduction or oozing body parts~ and you would be surprised at how many times we have to enforce it! Oh, this made me laugh out loud.